Kartenportal.CH is the specialist portal for maps from libraries and archives in Switzerland. The metacatalogue provided contains half a million maps from all over the world – from mediaeval manuscript maps to current printed ones. Find the maps to suit your needs quickly and simply using our map search. 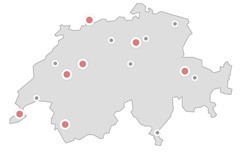 The collection profiles of all Swiss map collections at a glance: the index with a location map and search function points you towards interesting map holdings in your vicinity and provides information on online services and specialist contributions from libraries and archives in Switzerland.